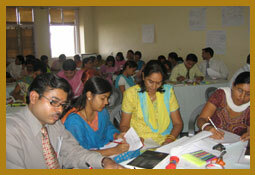 T he A chievers P rogramme ( TAP ), invites a number of international Educators to conduct teachers' training workshops here in India. Today, in the information/internet age, teachers need to upgrade their skills on a regular basis. Teaching needs to be replaced by learning. It is our mission to provide teachers with the skills necessary to educate students in the emerging information age, and focus on the context in addition to the content. thus the role of a teacher changes to that of a motivator, counsellor and facilitate information gathering rather than an absolute authority .What students need to be taught is how and where to get the information, and how to use that information in real life, rather than rote learning or cramming. Learning should become more experimental and more meaningful. Topics covered are: math’s and science, emotional intelligence, new methods of learning, time management, enquiry and experience based learning, multiple intelligence, class room management, inculcation discipline, motivation, team work, learning styles, study habits, reflective teaching, use of audio visual aids in teaching , experiential learning, child-centered curriculum design, inclusive environments, and building problem solving and conflict resolution skills in children. 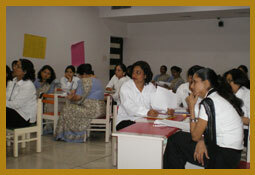 Our first International Educationist from Canada conducted professional development workshops for TAP on critical thinking - in March - April 2004. Today we have International Educationists, University Professors, and Education Consultants who offer their expertise to teachers in India from U.K., U.S.A., New Zealand, Germany, Costa Rica, Australia, Canada & Sweden, and other countries. 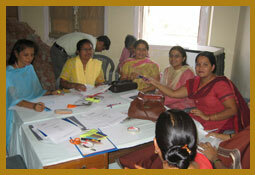 At an average we have at least one international resource person conducting workshop for TAP every month. A number of Teacher training workshops by reputed international educationist are lined up for 2018- 2019.